Home sellers’ optimism has been dented by Brexit turmoil with asking prices rising at their slowest pace in March for eight years, says Rightmove. The property listing website’s monthly house price survey followed a series of gloomy forecasts last week, which indicate the market is slowing down. 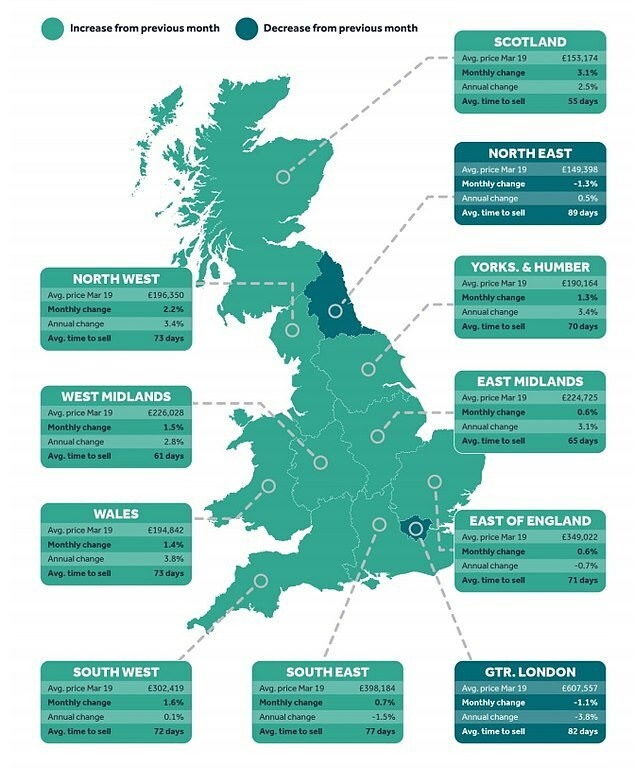 Unusually for a traditionally buoyant time of year, the average price of property across the UK coming to market in March rose by just 0.4 per cent, or £1,287, to £302,002. 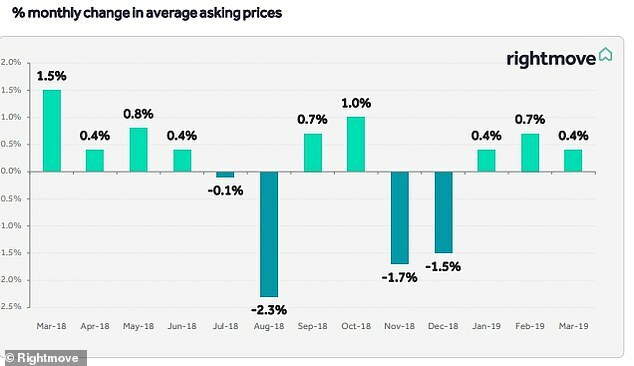 This is the lowest average monthly rise at this time of year since 2011, and considerably lower than the 0.9 per cent average over the last seven years. Most regions saw asking prices rise in the month to mid-March, except for two. The average price of freshly-listed homes in London was down by 1.1 per cent on the previous month. Asking prices in the capital are down by 3.8 per cent annually. The only other region to record a monthly fall is the North East, down by 1.3 per cent. Miles Shipside, Rightmove director and housing market analyst said: ‘While March marks the start of spring, temperatures have yet to rise in the housing market. ‘Buying activity remains cooler than usual, with hesitation as some buyers await a more settled political climate. Their respective pricing histories are very different however, with London prices still 68 per cent higher than 10 years ago. In contrast, the North East has seen new seller asking prices up by just 8 per cent in the same time-span. Guy Gittins, managing director of estate agents Chestertons, says: ‘It was almost inevitable that the uncertainty of Brexit would drag property prices down in the short term, especially as the date gets closer and many buyers take a ‘wait-and-see approach’. ‘However, we have experienced an incredibly busy start to the year, with a sharp increase in viewings and offers throughout January and February, which reflects pent-up demand and suggests that prices are now at a level that buyers are comfortable buying. The figures come a week after a RICS market update revealed that the number of homes coming up for sale dwindled to a record low last month. The research found that nearly 80 per cent of estate agents cite Brexit uncertainty a the cause for the slowdown. Over 70 per cent said political wranglings were hampering both would-be buyers and sellers, while only 8 per cent believe Brexit is having no impact on the market. A UK Finance market update also found last week that the number of first-time buyers and movers was on the rise, but the figures are not as recent as the RICS or Rightmove studies. Brian Murphy, head of lending for Mortgage Advice Bureau said: ‘The latest report from Rightmove highlights what we’ve been seeing on the ground for some time, which is that whilst the market in London and the South East remains subdued, in other regions of the UK the momentum continues with buyers transacting in reasonable numbers despite the current political and economic climate.